Not only is her name a mouthful, Alana Martina Dos Santos Aveiro, she also hails from a famous lineage. Alana may be just an infant, but she already has our eyes set on her. It would be surprising if it were not so, not when her father is the one and only CR7, the Portuguese football player and one of the world’s best, Cristiano Ronaldo. She is the first child of Ronaldo and his Spanish model girlfriend, Georgina Rodriguez, welcomed in 2017, a few months after her half-siblings, twins Eva and Mateo made their arrival through an unknown surrogate. The little one arrived on Sunday the 12th of November 2017 in Hospital Universitario Quironsalud in Madrid, Spain. Her name was a joint decision of both parents; Ronaldo chose the first name, Alana while her mother chose Martina. According to Portuguese naming culture, the maternal and the paternal surname makes up a child’s last name. Thus, her surname is Dos Santos Aveiro (basically from her father’s side). She is the second daughter and fourth child of the football star and his first child with his girlfriend, Rodriguez. While he missed her twin siblings’ birth due to a football tournament in Chile, he was around to witness Alana’s arrival. Alana was born nine days before the due date and her birth was a planned one. It was scheduled as such, perhaps to coincide with when her famous father would not have any professional engagement. Ronaldo was with the Spanish side, Real Madrid FC and was also preparing for the 2018 World Cup at the time of her birth. He would later sign a €100 million contract with the Italian club, Juventus in 2018. Following her birth, Cristiano took to his Instagram where he has over 158 million followers to announce the arrival of his daughter, Alana Martinez Dos Santos Aveiro. Alana Martina is still a baby, so a career would be out of place to be associated with her. While we follow her evolution as she grows before our eyes, we are diehard Ronaldo fans, after all, and so, everything about him from his life to his career, controversies down to his family piques our interest, we can’t wait to know what she becomes. Meanwhile, Alana’s father is a professional football player for the Italian football club, Juventus, and her mother is a professional model. Whether she would follow in her mother’s step, turn to her father’s, forge a career in athletics, or even blaze her own trail, only time will tell. However, with her precedence, we rest assured that whatever she decides to do would be nothing less than celebratory. Despite not having a career of her own yet, she can afford to live in affluence as her father is one of the highest paid celebrities in the world. He has a net worth estimated to be $450 million. As earlier mentioned, Alana Martina Dos Santos Aveiro is the daughter of Georgina Rodriguez, a model from Jaca, a city in north-eastern Spain. Her maternal grandfather, Jorge Rodriguez was reportedly convicted of cocaine trafficking and her maternal grandmother is Ana María Hernández. On her father’s side, the world class footballer was born to Maria Dolores dos Santos Aveiro and José Dinis Aveiro who was a municipal gardener and part-time kit man. Her parents allegedly met at a VIP Dolce & Gabbana event and started dating in late 2016. She has three elder half-siblings through her father. Cristiano Ronaldo Jr. is the oldest of the pack and was born on June 10, 2010, in a Florida, U.S. hospital, supposedly through surrogacy. Five months before Alana Martina was born, her family welcomed twins, Eva Maria and Mateo Ronaldo via surrogacy in the United States on June 8, 2017. 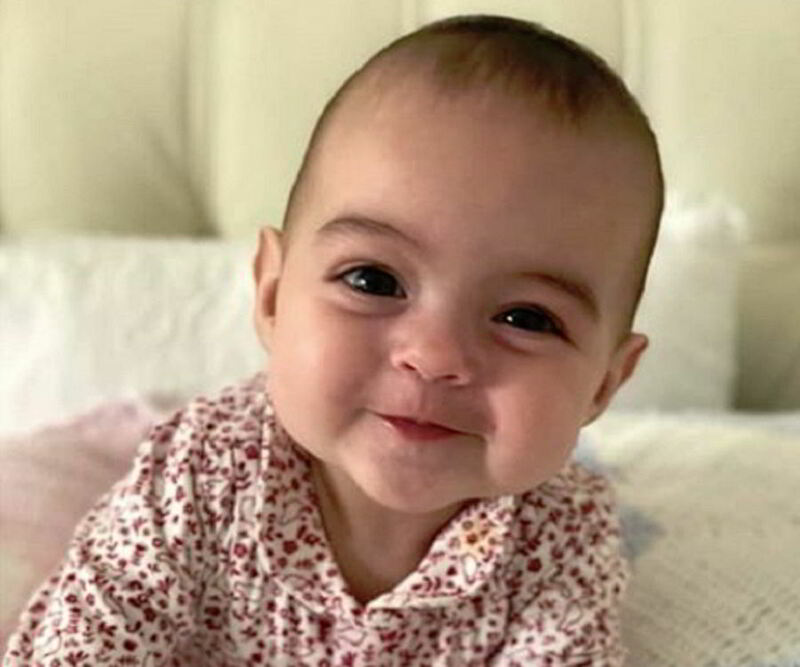 Less than a year after Alana Martina Dos Santos Aveiro was born, her model mom sparked pregnancy rumors. While posing in a video in her fiance’s fan page during the 2018 Fashion Week at Gran Canaria, eagle-eyed fans observed that she looks pregnant. But that was not the case; though she looked rounder then, she was understandably, still recovering from childbirth. However, even if she was indeed expecting, it would be delightful news for the football star and his family. The Portuguese player loves a large family and would love to have more kids in the family. He has previously said he would like to have more children, preferably seven. He is also a good father and shares a tight bond with all of his children. The family of six live in the Italian city, Turin.